. . WOMEN’S EQUALITY . .
As the world celebrated International Women’s Day, the International Criminal Court (ICC) this week got its first all- female presidency. ICC judges on Wednesday elected Judge Silvia Fernández de Gurmendi of Argentina as President of the Court for a three-year term with immediate effect, and two other female judges as her Vice- Presidents. A trained diplomat, Gurmendi has been a judge at the ICC since 2010. Judge Joyce Aluoch of Kenya was elected First Vice- President and Judge Kuniko Ozaki of Japan as Second Vice-President. The outgoing presidency was headed by a man (Judge Sang-Hyung Song of South Korea), who was seconded by one female and one male judge. This is the first time the ICC has had an all-female leadership. It already has a woman Chief Prosecutor, Fatou Bensouda of the Gambia. The Presidency – consisting of the President and the two Vice-Presidents – plays a key role in providing strategic leadership to the ICC as a whole. According to the ICC, the Presidency “coordinates with the other organs and seeks the concurrence of the Prosecutor on matters of mutual concern. In accordance with the Rome Statute, the ICC’s governing treaty, the Presidency is responsible for the proper administration of the Court, with the exception of the Office of the Prosecutor. 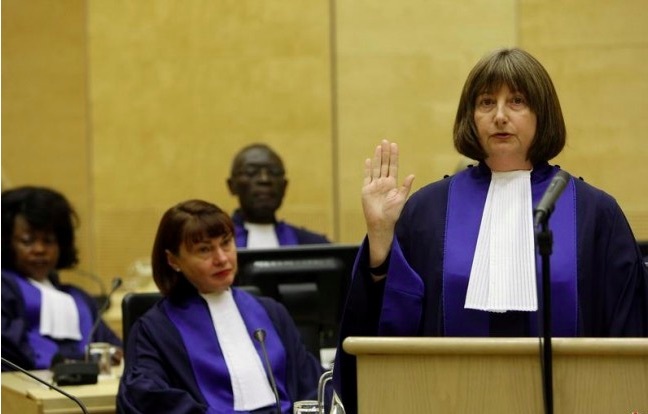 On Tuesday, six new ICC judges (all men) were also sworn in: Marc Perrin de Brichambaut (France), Piotr Hofmański (Poland), Antoine Kesia-Mbe Mindua (Democratic Republic of the Congo), Bertram Schmitt (Germany), Péter Kovács (Hungary) and Chang-ho Chung (Republic of Korea). They were elected for nine-year terms during the thirteenth session of the Assembly of States Parties (ASP) to the Rome Statute in December 2014. Do women have a special role to play in the peace movement? The 30 articles in CPNN linked to this question make it clear that women indeed have a special role to play in the peace movement. See the following for an historical explanation of why this is true.